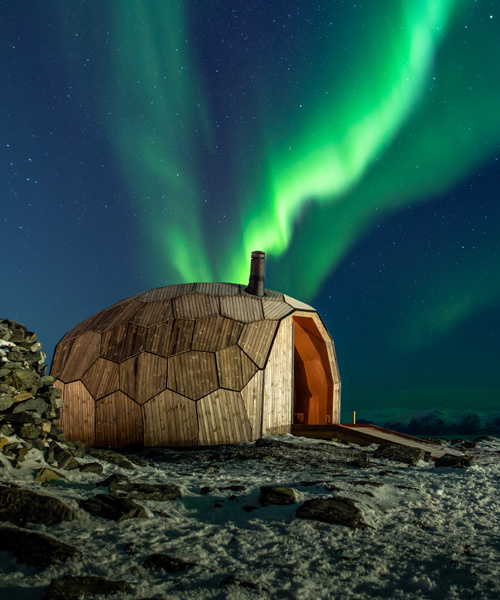 for hikers journeying into the arctic circle, this small mountain cabin in norway provides much needed warmth and shelter. 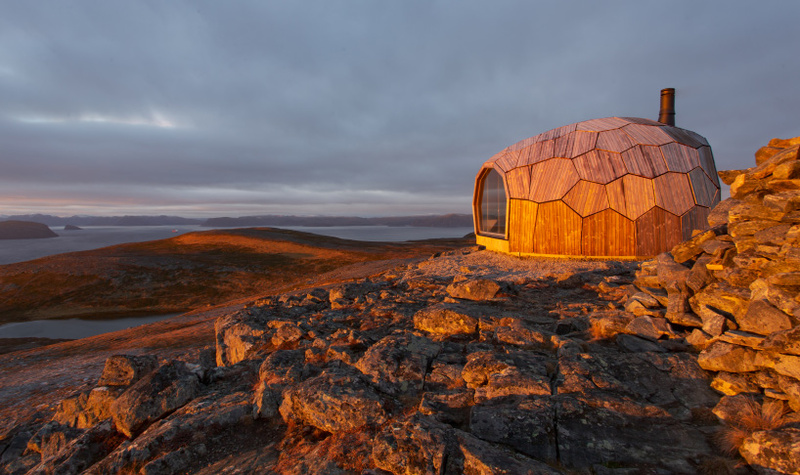 the project is the first of two warming huts designed to promote hiking in the town of hammerfest. 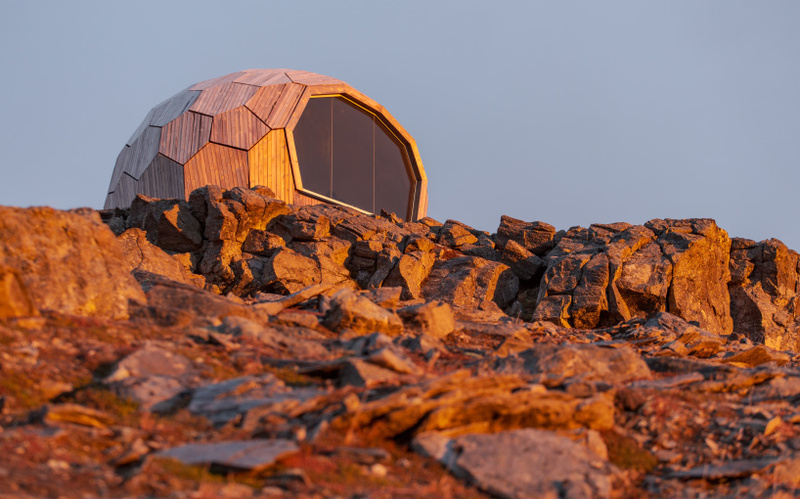 the brief called for a small mountaintop structure that aligned with the existing landscape. 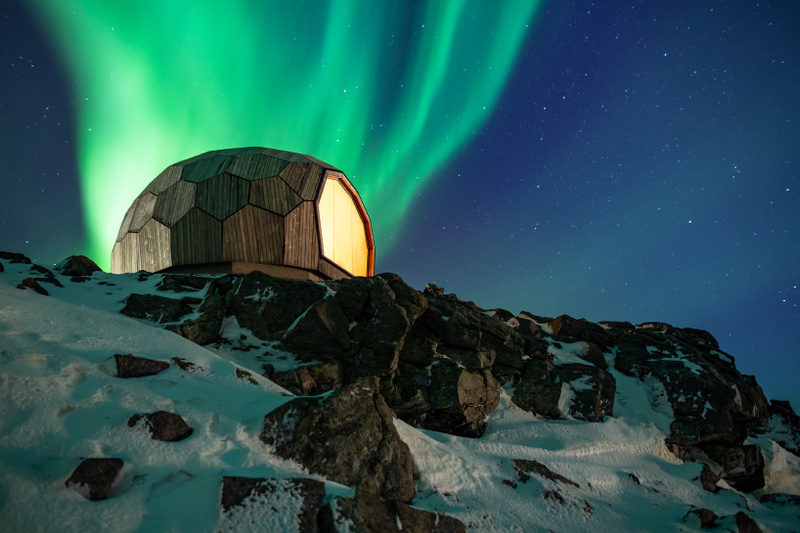 the cabin includes a wood burning stove, simple seating, and views of the arctic terrain below. 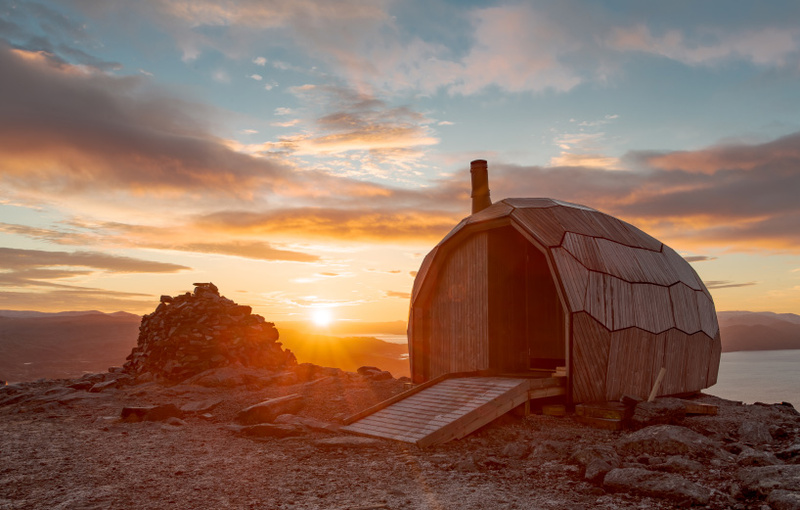 the project was commissioned by the hammerfest chapter of the norwegian trekking association (DNT), who tasked norwegian firm SPINN arkitekter with designing the cabin. 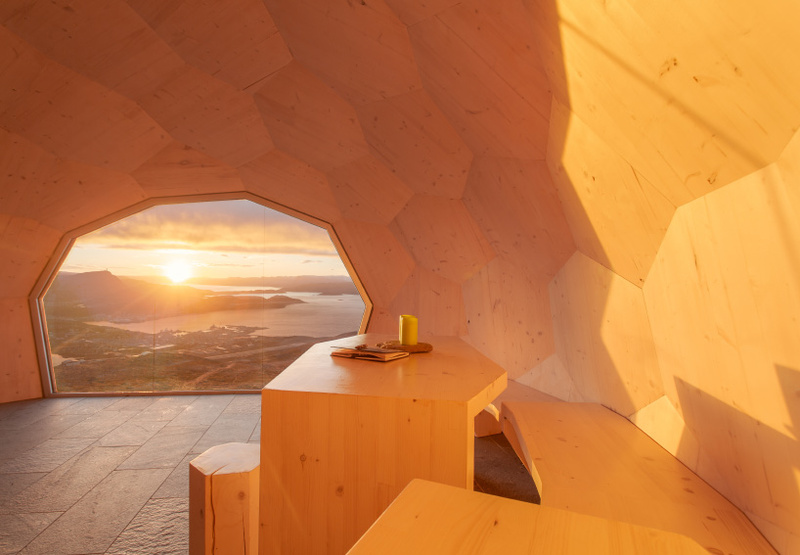 to translate their sketches of an organic wooden shell into reality, the architects at SPINN contacted FORMAT engineers to help them produce a structure that could be manufactured precisely enough to be built on top of a mountain by a group of local volunteers. the site was mapped in 3D using a drone and photogrammetry software to give a detailed map of the surface, which was then used as a baseline for form-finding. 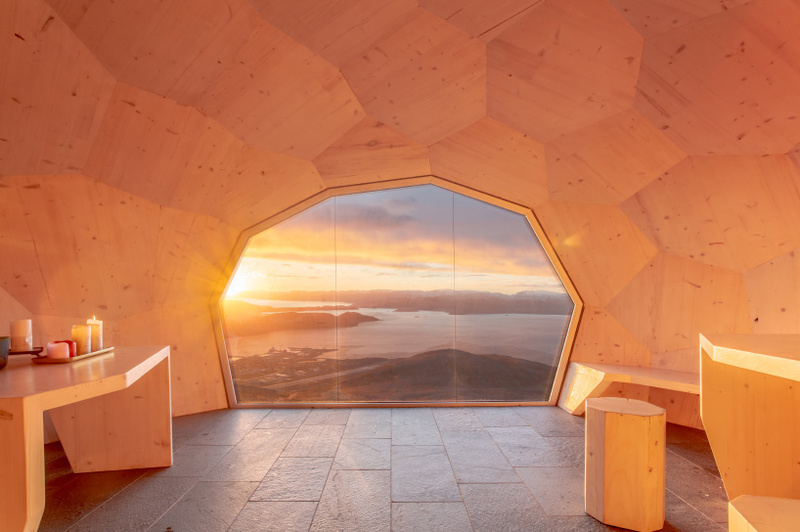 the result was a wooden cross-laminated timber shell with 77 unique panels that fit together like a 3D puzzle. 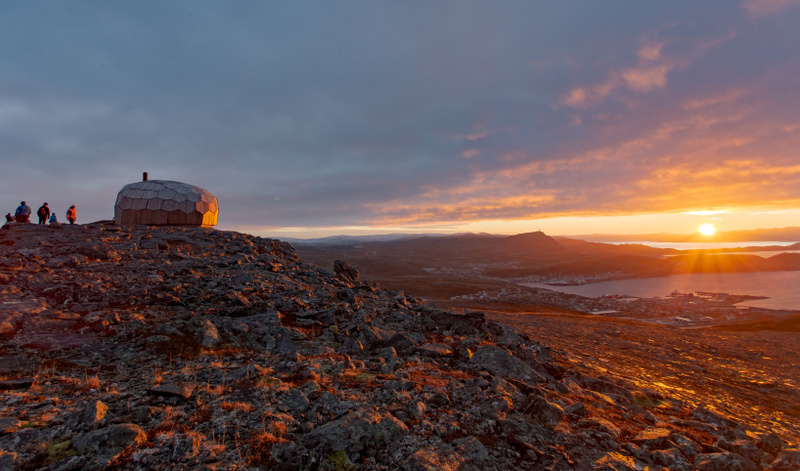 the design was then tested against simulated wind conditions to make sure that it would withstand winter arctic storms and extreme wind conditions, while remaining snow-free. 3D printing was used extensively to test out how the construction would fit together, and to test cladding options for the exterior. as the design had a higher budget than the client expected, a visualization and animation were made as part of a crowdfunding effort to raise the money necessary to realize the project. local businesses volunteered materials and services, while kebony donated materials for the exterior cladding. according to the plan, the hiking association members would be responsible for raising the structure and transporting it to site. in the end it was decided to build the structure in a controlled warehouse environment, where it would be put together and tested, then partially demounted for transport. 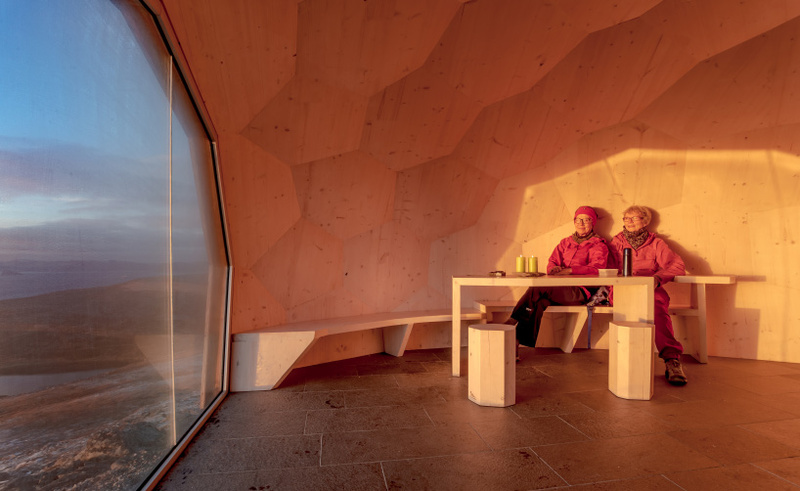 one group of volunteers got the main structure of prefabricated CLT panels mounted together over a period of four workdays, while another group was responsible for cutting and measuring the frames and panels for the outer cladding based upon 1:1 drawings from SPINN. 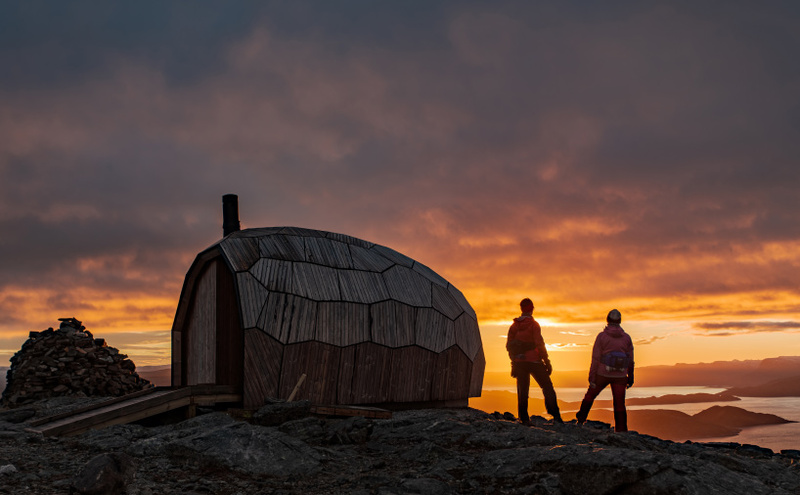 the volunteers spent over 1,500 hours on the construction of one cabin, plus the outer cladding for both. the only professional work on the project was the two-layer bitumen waterproofing of the shell, and the pouring of the foundation on site. split into two pieces, the first cabin was loaded onto a flat bed lorry before being lifted into place and winched together. the window, fireplace, ramp and interior furniture were all fitted into place on site. 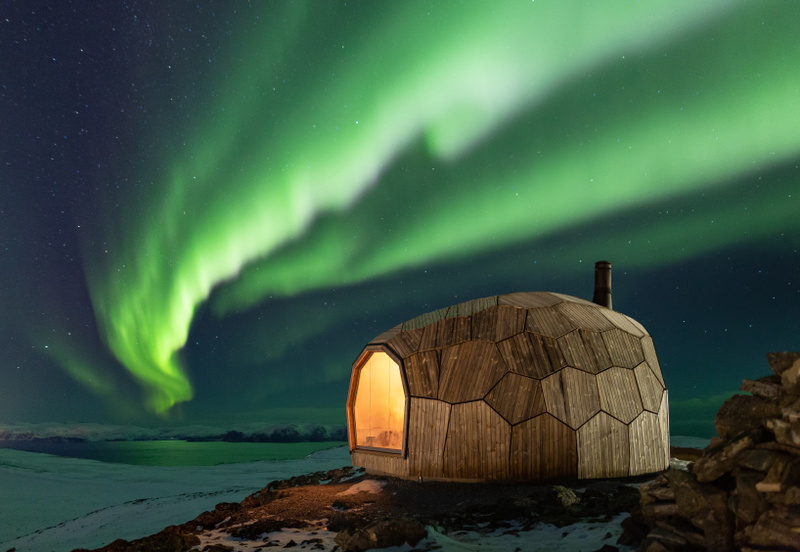 the continued success of the project means that a second cabin will be built in the mountains on the other side of the town.